As humanity has evolved, so has our jewelry. These days, we don’t always make our own; instead, we can buy from expert craftsmen. However, the jewelry industry is currently in a state of flux, trying to find its footing amid a strong current of changing economic and technological trends. What lies ahead in the future for jewelry? Let’s take a look at some of the biggest trends hitting the industry today. Jewelry transcends time, place, and culture, as it’s been a part of the human experience almost since the first man stood upright. Ancient humans made decorative necklaces from animal skins or obsidian, while early civilizations used homemade jewelry to barter for goods, express their creativity, and enhance their natural beauty for thousands of years. Jewelry also served as a way to distinguish one’s status. For example, the ancient Romans only allowed high-ranking officials to wear rings. As time went on, jewelry became more and more accessible to people of all social standings. Eventually, rings, bracelets, necklaces, and earrings became common accessories that everyone could enjoy. However, the jewelry world changed forever when the De Beers Company launched a massive ad campaign for the engagement ring in the 1930s (soon after, in 1947, they followed up with the iconic slogan “a diamond is forever”). Jewelry was no longer a purely personal creation; instead, jewelers created gorgeous pieces for people to purchase and gift to other people. Diamond rings became a staple in our culture across all income brackets, and jewelry sales surged. Today, jewelry is a massive industry encompassing everything from simple, cost-effective pieces to elaborate luxury items. But the industry is hardly in stasis—in fact, it’s just the opposite. As consumer demands change, technology evolves, and new companies spring up, the world of jewelry faces an uncertain (but exciting) future. One of the newest trends in modern jewelry is the rise of new consumer markets. For example, China is quickly becoming one of the major players in the diamond industry. This is particularly true among millennial Chinese women, who accounted for a whopping 68 percent of diamond sales—more than India, Japan, and even the U.S. According to the Diamond Administration of China, the country’s increasing affluence has made it the second largest diamond-buying nation in the world (following closely behind the U.S). Industry leaders all over the world have noticed China’s consumer boom and responded in kind. Both large and small diamond traders are investing in major Chinese cities like Beijing and Shanghai and establishing hubs in the trade friendly city of Hong Kong. Tapping into the Chinese market also means shifting in marketing strategy. While Western consumers have welcomed the idea of the diamond as a gift, Chinese women view diamonds as a fashion accessory—and one that they don’t need to receive as a gift from a man. This paradigm shift presents an opportunity for diamond sellers to increase their core customer base. As nations like China become wealthier, they will likely become more interested in luxury goods, from high-fashion clothing to diamond jewelry. The jewelry industry will have two options: it can expand, opening its arms to different cultures, demographics, and marketing techniques, or it can become more narrow, focusing more intently on niche markets. The choice will vary with each company, but China’s rising influence indicates drastic changes in the coming years. One of the benefits of the information age is that we, the consumers, are more knowledgeable than ever about the products we use. We now understand where things come from—and under what conditions they are made. This has lead to the rise in demand for “fair trade” products, from sustainably-grown coffee beans to conflict-free diamonds. What makes a diamond “conflict-free”? Simply put, these diamonds are not illegally traded to fund conflict (such as war or human trafficking) in their country of origin. Many nations in central and western Africa, such as Sierra Leone or Zimbabwe, have used slaves to mine diamonds or used the funds from diamond sales to finance brutal civil wars. Armed with the knowledge of these atrocities, consumers all over the world are taking a stand. Finding jewelry made from ethically-sourced gemstones and metals has been a hot-button issue for years. In fact, the Gemological Institute of America notes the establishment of the Kimberley Process in 2002 helps to ensure the ethics of diamond suppliers. According to the GIA, this process has helped guarantee that 99% of diamonds available today are sourced in ethical and sustainable ways. However (as TIME Magazine pointed out in a 2015 story), the Kimberley Process isn’t perfect. To prevent conflict diamonds from slipping through a loophole, many jewelry outlets have developed their own fail safes, ranging from harsher scrutiny to a closer relationship with their suppliers. In this way, the jewelry industry is both responding to customer demands and helping end human rights violations in the world of precious gems and metals. The internet is, without a doubt, the largest trend influencing the jewelry industry. Online jewelry sales are growing each year, with some economists predicting that they will capture at least 15 percent of the market by 2020. But as our shopping carts shift from physical objects to virtual ones, where does this leave the brick and mortar stores of yesteryear? The answer depends on who you ask. Some jewelers claim that technology is tanking the industry. E-commerce sites have less overhead and can offer luxury jewelry at lower prices, making it harder for physical stores to compete. 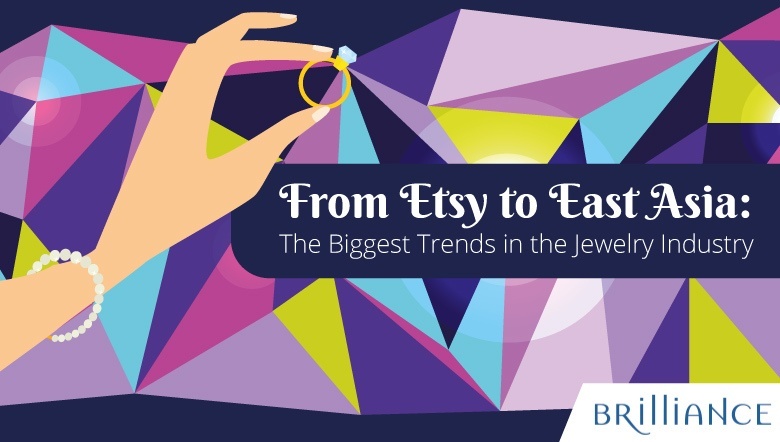 Sites like Etsy, which allow people to sell their homemade jewelry worldwide, also cut into jewelers’ profits, as they open up the market to a wider variety of products and prices. Finally, technology like social media has changed the how many shoppers spend their money—after all, some claim, a vacation to the Caribbean will get more “likes” than new diamond stud earrings (even if they are conflict-free). While this societal shift has some in the jewelry industry worried, other jewelers consider the world wide web an exciting new way to reach potential customers. Major jewelry retailers use social media to advertise their pieces (targeting the millennial generation, whose ad blockers and DVRs make traditional advertising less effective). Other companies choose to sell their jewelry online, expanding their consumer base from their local community to the whole country or even the world. In this way, the jewelry industry can grow and expand to include anyone who may want a ring, necklace, or pair of earrings. The jewelry industry may experience some growing pains as technology and global trade evolves, but don’t worry – it’s not going anywhere. Global jewelry sales are expected to reach an estimated $278 billion by 2020! As long as there is a young woman looking to express herself, a couple in love and getting married, or anyone else who wants something beautiful to wear, the jewelry industry will be there to provide the perfect piece.